In his book Zen in the Art of Writing, Ray Bradbury discusses his habit of making lists and how it helped him generate story ideas. He especially discusses making a list of favorite things and using those things as the basis for his stories. One of the things on his personal list is circuses, which led to his writing of Something Wicked This Way Comes. However, I’m not discussing either of those books today. I mention them only because I imagine Stephanie Garber having circuses on her list of favorite things every time I think of her book Caraval. Caraval is the tale of Scarlett Dragna, who seeks to free her sister and herself from an abusive father by escaping into an arranged marriage. The only bright spots in Scarlett’s life are her sister and the hope of one day attending Caraval, a once-a-year performance game that is a cross between a carnival and a season of the television reality show Survivor, but with magic thrown in. In this game, players look for clues hidden throughout a small city on an island owned by an enigmatic figure known only as Legend. The first player to find all of the clues wins the grand prize: the fulfillment of a single wish. For Scarlett, winning Caraval could mean achieving her greatest desire. Scarlett’s sister Donatella is the complete opposite of Scarlett. Stubborn and willful, Donatella has no problem looking for trouble and is not satisfied with Scarlett's arranged marriage. She has her own reason for wanting to win Caraval, and she does whatever she thinks necessary to make sure she and her sister are invited to the next game. I love this story because of its unique concept and originality. 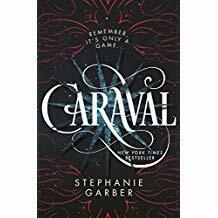 Caraval combines a Victorian (but not steampunk) setting with mystery and the sense of wonder most children associate with circuses and carnivals. The characters are well drawn, the plot is nicely paced, and the ending is as right as it is satisfying. If you love young adult/new adult fantasy or magic realism, this is definitely a read for you.